Designed for audio professionals, Spectre provides 20 different multi-channel and multi-trace meters including Level, VU, Spectrograph, Oscilloscope, Spectrogram, LU and LU History. With, Spectre has been rewritten from the ground up to support the latest loudness standards as well as making it even more powerful. Each meter can have any number of traces or indicators, and each trace can have it's own number of input channels, mixing, filtering, ballistics and color (including transparency). You can have as many meters (or copies of meters) as your screen will allow! Spectre also gives you very precise control over color gradients. Beyond the performance upgrade, Spectre’s updated meters are now easier to configure. Additionally, they are now Retina-ready and fully optimized for OS X, including improved full-screen and multiple display support. 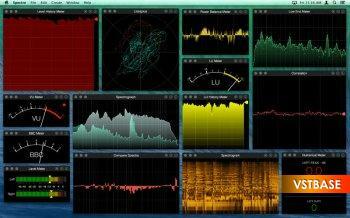 • Traces have their own spectral analysis settings.